Rainwater Harvesting systems provides water for flushing WC’s, washing machines, gardens, washing cars and outside of the house; this in turn limits the use of the mains water which can be quite costly and high energy use. The system catches the rainwater before it goes into the ground or drains. The water is soft and natural and does not need any additives. As well as being cost effective it also contributes to flood prevention in local areas especially during storms and heavy rain conditions. 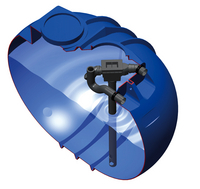 Easy to install treatments tanks for single house to 50 people. Solar North Wales provides lightweight, easy to install, compact small sewage treatments plants which have low installation depth. Ground source heatpumps circulate a mixture of water and antifreeze around a loop of water that is buried under the ground. 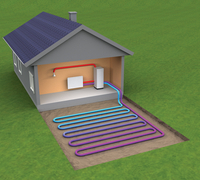 The heatpumps are capable of heating water for the heating and hot water circuits of a house. Solar North Wales works via their sister company mini muckshift to install these heatpumps.